The cold and cough remedies have been removed from the shelves in the past few days. It has finally been discovered that these drugs are not very effective and do not cure the common cold. They can be harmful if given in massive doses, which some mothers do in an attempt to comfort a sick child. Years ago, when I was a General Practioner, most of these drugs were given only by prescription. They were not available over the counter. I prescribed gallons of Triaminic and Robitussin. Even Benadry required a prescription. One of these days someone is going to blow the whistle on all the vitamins and herbal drugs. None of these have scientific proof of being effective, but are taken by the truckload everyday. People swear by them. We are a drug-crazed culture. We need a pill for everything. Pills to calm us down and pep us up; pills to clean our arteries and neutralize the acid in our stomachs; pills to increase the libido and erect certain organs; pills to make us baseball heroes and Olympic gold medal winners; there is a pill for almost everything. Doctors have also greatly abused drugs by over prescribing for everything. Penicillin and other antibiotics have been prescribed for colds and other viruses for years because the patient expects something from the doctor for that expensive office visit. As a result, bacteria have developed resistant strains such as the now popular MRSA. This is a very lethal strain of the staph bacteria which caused more deaths last year than AIDS. It’s interesting that we don’t see Elizabeth Taylor or other movies stars doing big fund raisers for MRSA like they have done for AIDS. Maybe it’s because MRSA is a germ which affects us common folks rather than gay actors. There is no cure for the common cold. Rest and chicken soup are about as good as anything for relief. I usually take an Actifed or two but now I have to give my drivers license to the people to purchase the stuff. Drug users apparently use Actifed and similar drugs to make methamphetamine. 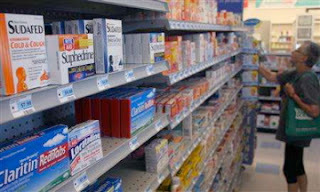 The drug stores must now keep track of everyone who purchases these drugs in hopes of catching potential addicts and illegal drug manufacturers. I fell like a criminal when I purchase Actifed so I have quit using it or anything else for my infrequent colds. My mother had the most effective cold medicine. When I was a kid, we kept a little whiskey in the house for medicinal purposes and to lace the egg nog at Christmas. When I got a cold, my mother would rub Vicks Salve on my chest and give me a hot toddy. The hot toddy is made from a little whiskey, lemon, sugar and hot water. It’s a great remedy and I always enjoyed getting a cold except for the Vicks Salve. Since I’m on the porch most of the time and out of contact with the rest of the world I hardly ever get a cold anymore. I am sort of looking forward to getting one this winter. Since I can’t get the cold medicines anymore, without a lot of trouble and embarrassment, I’m going to try my mother’s sure cure. At least I will enjoy the misery. I’m glad my mother taught me about this great cure, but if she were alive today the Child Protective Service people would probably accuse of her of child abuse. They would also be down on her for using the switch rather than Ritalin. The only thing I take is a daily vitamin and an aspirin a couple of times a week. When I get a cold I take Nyquil because it has the same bite as a toddy and makes me sleep. I am afraid of all of the other. Sadly, the meth problem is real. In tiny San Saba the adults decided a few years ago that NO minors should be able to get their hands on alcohol under any circumstances. No more river parties or six-packs of beer snuck out after a ball game. They succeeded......so the kids there all went to meth and became drug addicts. the meth is easier to get, doesn't smell and the parents don't have a clue until it is too late. one of the top 5 drug spots in the state. Think they wish they would let them have a keg of beer every once in a while instead??? ?